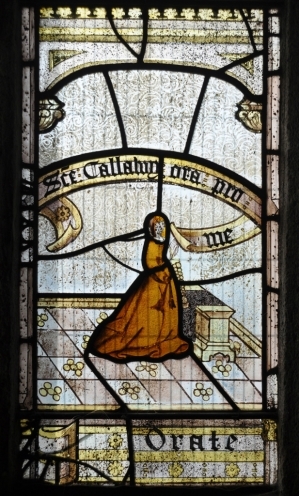 Callawy (Callaway) Window in the Church at St Neot, Cornwall, England. 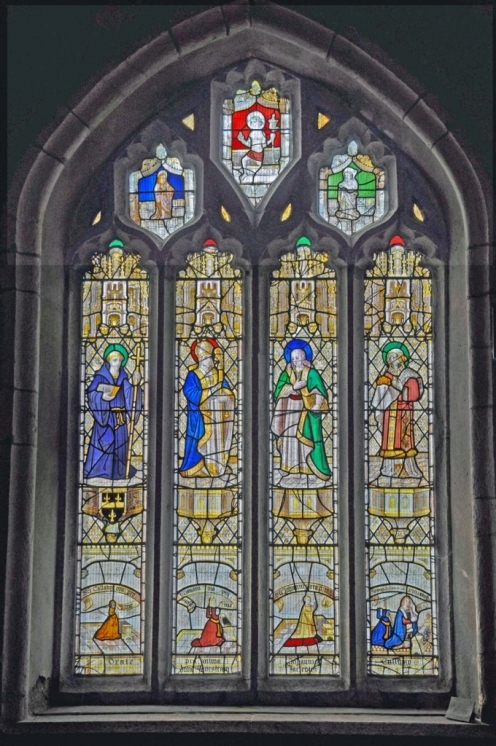 Modern image of the present window. The above images show the Callawy name in the bottom panels of the modern Callaway window. 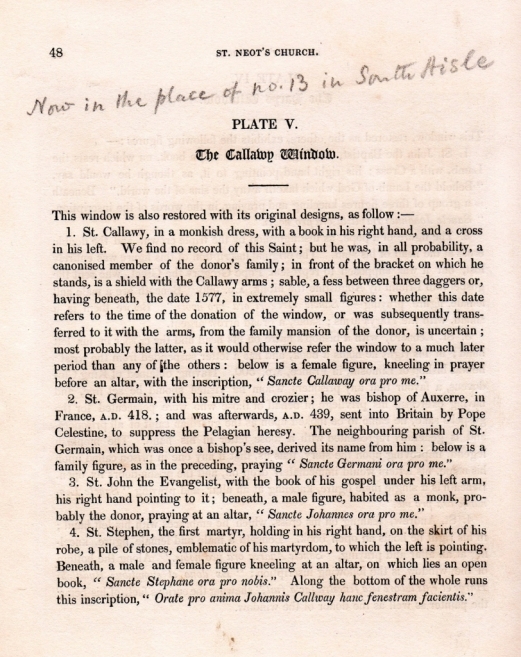 The Callaway window was restored by Hedgeland in the late 1820's.The image below is copied from the 1830 edition of "Hedgeland", it details his description of the window at that time. Further alterations/restorations have subsequently taken place. 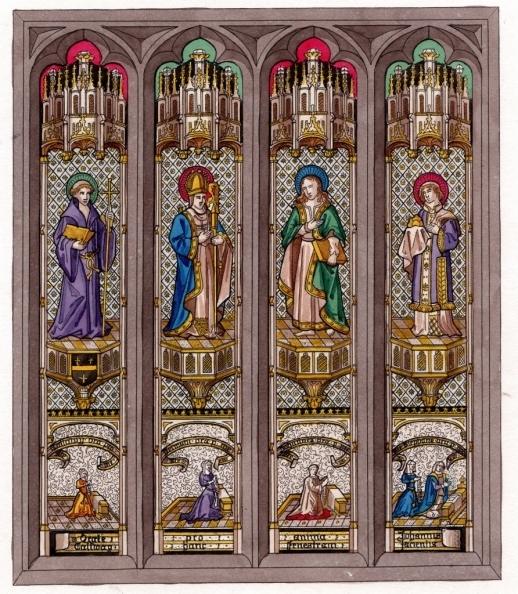 The colour plate shown below is featured in the 1830 book opposite the text immediately above. If you compare the colours of the "1830" plate with the photo taken recently (Oct 2014) you can play "spot the changes!". Start with the coloured halo around the head of the figure in the righthand panel (St Stephen). 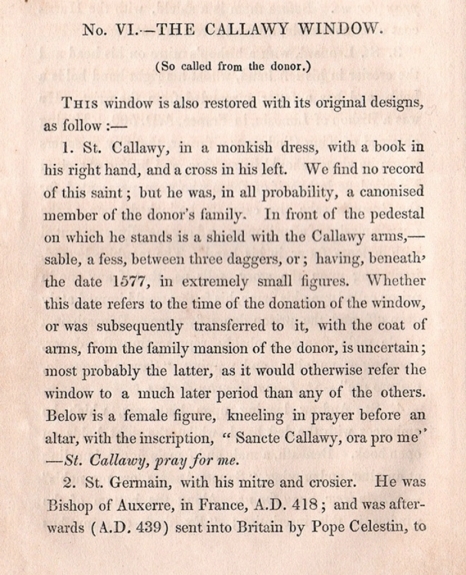 Below is a description of the window as published in the 1844 3rd edition of the book by the then vicar of St Neot, Rev Henry Grylls. Joanna Mattingly's study gives much detail of the many changes in the lives of the windows! Below are a small number of facts in the very comprehensive Mattingly research that relate specifically to the Callaway window. She mentions that the North Chapel was built for the Tubb(e) and Callaw(a)y families who were linked in marriage. John Tubb(e) married Joan Callaw(a)y during the late 1510's or early 1520's, she considers the likely date of the windows is 1524 or 1525. Many spellings of the same name differed during that time as was the case with many words. As mentioned above the Tubbs and Callaways were related by marriage. The Tubbs held land in the Manor of Draynes in the 1490's. 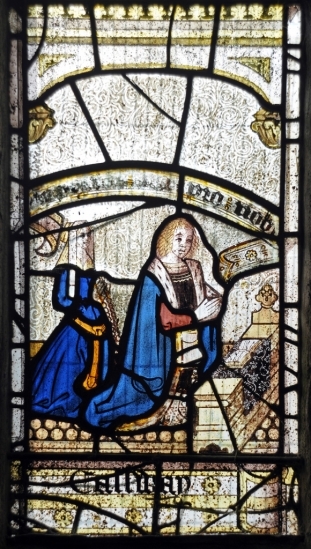 Robert Tubb was vicar of St Neot 1508 to 1544 with a living worth £13 6s 8d in 1522. 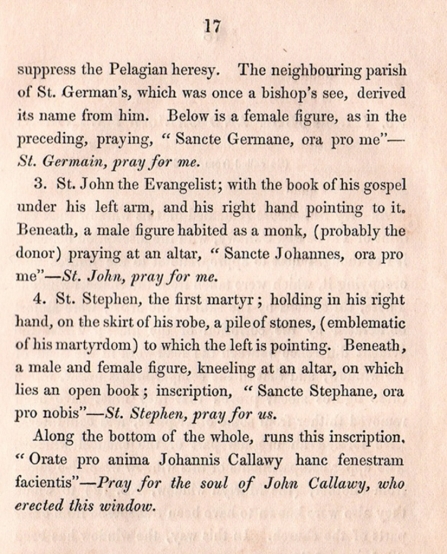 Robert's brother William had a son who was the "John" who married "Joan" (at that time Joan was often spelt as Jone). John was very much involved with the Church. A paragraph from Mattingly states "John Callaway is listed as a tinner in 1535 and a Tubb stamping mill in St Neot was on former Callaway land" They owned land around and in St Neot, the Manor of Trengoff in Warleggan and Trenay in St Neot. There is a small stream in the parish still called Callaway Water today. John Callaway's land was assessed at £2 of land in 1522, this has risen to £10 of land in 1525. 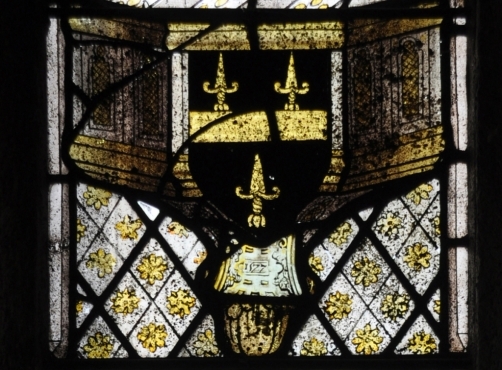 In 1577 the Callaway coat of arms was added to the window. Mattingly postulates that one of the possible reasons that the windows were not destroyed (during the Interregnum) was that the Callaways were still numerous and active (in the locality) in 1651. 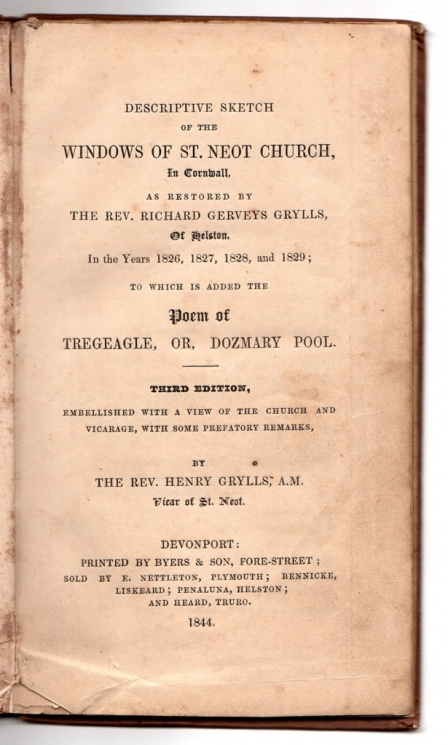 The page on this site "Booklets, Leaflets and Pamphlets" contains images of the Rushforth description of the windows of St Neot Church.